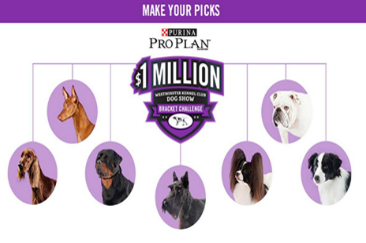 Purina Pro Plan $1 Million Westminster Kennel Club Dog Show Bracket Challenge – Win $1 million dollars! ENTER SWEEPSTAKES HERE – Purina ProPlan Sweepstakes page. ENTRY LIMIT – Limit: one (1) entry per person/email address. ELIGIBILITY – Purina Pro Plan $1 Million Westminster Kennel Club Dog Show Bracket Challenge (the “Contest”) is open only to legal residents of the fifty (50) United States and the District of Columbia who are at least eighteen (18) years old at the time of entry. SWEEPSTAKES ENTRY PERIOD – The Contest begins on January 3, 2017 at 1:00 p.m. Eastern Time (ET) and ends on February 13, 2017 at 5:00 p.m. ET. PRIZES – ONE (1) GRAND PRIZE: $1,000,000, awarded as a check. If there are multiple winners, the Grand Prize will be split equally among all winners.